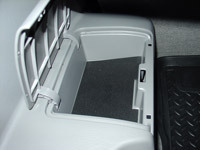 The 4th Generation Toyota 4Runner has quite a number of storage compartments around the interior. Some small, some large, some very useful, some not so useful. One thing in common though is that they all have a plastic type interior and items kept within will slide around and become a distraction. That is where this product comes in. It is nothing new and revolutionary. 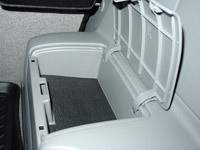 People have been lining their storage compartments with felt, shelf liner, tool drawer padding, etc., for some time now. This products benefit lies in the fact that you don't have to be bothered finding the materials and creating the templates/patterns to make a precision fit. From the time you order, to time of receipt will only be a few days, in my case two days to be exact. 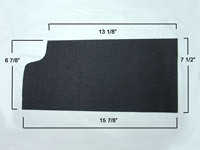 The material of the pads is an industrial grade, neoprene sponge rubber with a textured surface on both sides. It’s the same material used on the bottom of mouse pads. 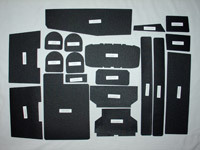 The Pads are only available in a kit, not individually, and come in black. 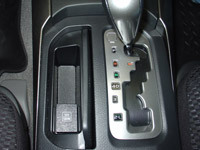 They are precision cut and have an OEM look and feel. 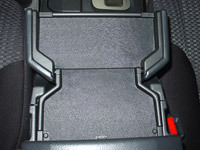 The pads are Non-slip, so what you put on them won't slide around. 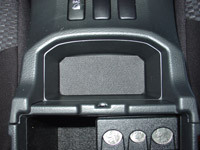 They dampen rattles and hide existing scratches. My initial question was, do these pads have a self-adhesive backing? Answer = No. Well, the flip out burger tray does have a self adhesive backing as otherwise these two pads would fall out of place. Included with the kit is a sheet of 3M double sided tape squares, enough to secure the entire kits contents. The primary reason for not having a full adhesive backing pre-installed, I was told, was because most people don't want to permanently stick something onto a new vehicle. During installation I could see that on some of the pads, not only was a full adhesive backing not necessary but it would be very cumbersome to position the pad precisly if it did indeed have a full adhesive back, due to the depth of many of the storage bins. I do recommend using at least a few tape squares per piece as otherwise the pad may be easily lost during vaccuming, or can stick to the bottom of a cup or water bottle. The downside to using the tape is that the pieces cannot be removed to do a more full detailing, for example if a spill occurs. 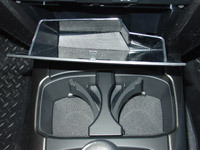 The compartment in which items will move around the most, causing rattling & noise, is the glove box. The pad that comes as part of the kit just lines the bottom of the box. 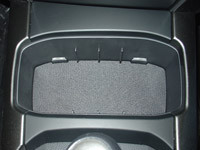 I ordered an extra piece of material which I cut myself (see dimensions below) to line the door of the glove box so that larger items which touch this part are padded as well. 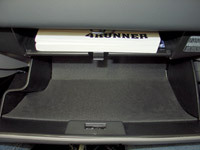 Each time you open the glove box, the contents move onto this door. Having it padded as well, I feel, makes for a more complete and professional looking job and will further dampen the noise.